Did FDR give too much to Stalin and thus pave the way to the Cold War? Since 1945, opinion has been bitterly divided on what FDR, Churchill and Stalin achieved at the Yalta Conference. Spain: Day 315 of 985 of the Spanish Civil War. Sweden: Swedish Foreign Minister Sandler announces that Sweden reserves the right to remain neutral. Spain: Day 680 of 985 of the Spanish Civil War. CBI - China: Day 325 of 2,987 of the 2nd Sino-Japanese War. Day 110 of 124 of the Battle of Henan. CBI - China: Day 690 of 2,987 of the 2nd Sino-Japanese War. CBI - Mongolia: Day 17 of 129 of the Battle of Khalkhin Gol, a border dispute between the Soviet Union and Japan. UK: Sugar rationing in Britain is reduced from 12 ounces to 8 ounces per person per month. UK: The British government abandons the notion of introducing conscription in Northern Ireland. Atlantic: German sub U-37 sinks the British ship SHEAF MEAD 150 miles west of Cape Finisterre, Spain. U-37 also forces the Argentinian ship URUGUAY to scuttle after getting into lifeboats. ETO - Norway: Day 49 of 63 of the Battle of Norway. The Allies continue withdrawing out of Norway. ETO - Belgium: Day 18 of 19 of the Battle of Belgium. King Léopold III offers surrender terms, which is rejected by Germany, as Hitler demands an unconditional surrender. ETO - France: Day 18 of 44 of the Battle of France. 97 British POWs are massacred at Le Paradis. Day 1 of 9 of Britain's Operation DYNAMO, the evacuation of Dunkirk. The first 7,669 troops (of an eventual total of 338,226) are evacuated to England by a hastily assembled fleet. CBI - China: Day 1,056 of 2,987 of the 2nd Sino-Japanese War. Day 195 of 381 of the Battle of South Guangxi. Day 27 of 49 of the Battle of Yichang. 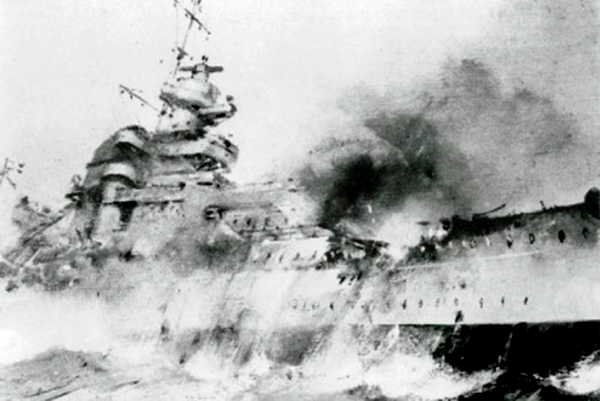 Atlantic: Day 2 of 2 of the sinking of the BISMARCK. The crippled BISMARCK is bombarded repeatedly by the Royal Navy until the crew scuttles her. 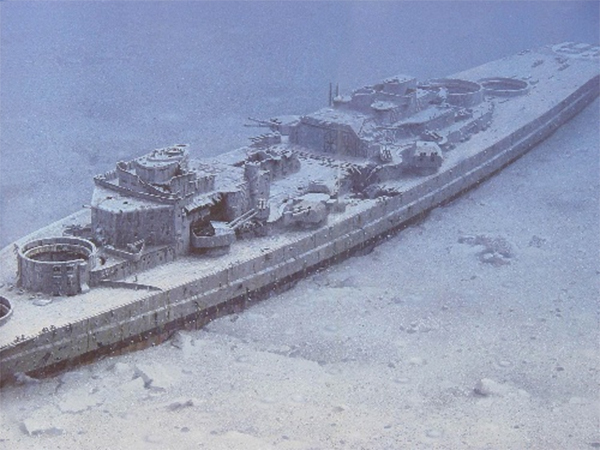 The Bismarck, resting in peace on the sea floor, June 1989. The big holes are the mounts where the guns sat. Held in place by gravity, they simply fell off when the ship was sunk by the British on 27 May 41. USA: President Roosevelt declares an unlimited state of emergency, which enables him to send more war supplies to the United Kingdom. The US Navy begins transferring ships from the Pacific Fleet to the Atlantic Fleet. Atlantic: German sub U-107 sinks the British ship COLONIAL off Guinea, French West Africa. MTO - Greece: Day 8 of 13 of the Battle of Crete. German troops capture Canea, thus securing the use of the anchorage at Suda Bay. This convinces the British to withdraw. MTO - Libya: Day 48 of 256 of the Siege of Tobruk. The Germans capture Halfaya Pass. Middle East: Day 26 of 30 of the Anglo-Iraqi War in Iraq. The 10th Indian Division begins advancing north from Basra toward Baghdad. East Africa: Day 352 of 537 of Italy's East African campaign in the lands south of Egypt. CBI - China: Day 1,421 of 2,987 of the 2nd Sino-Japanese War. Day 21 of 21 of the Battle of South Shanxi. The Japanese capture this region of China. 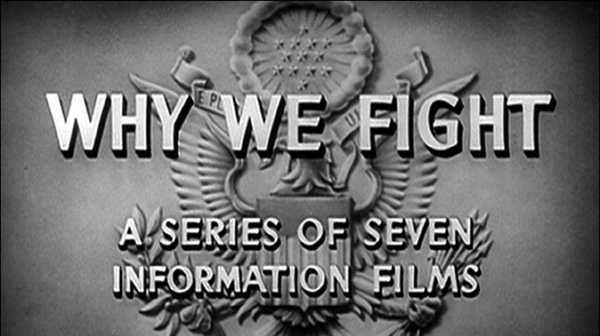 USA: Prelude to War, the first of seven Frank Capra-produced films in the Why We Fight series, premiers to American troops to show them the dire necessity of combating the Axis Powers. Virtually everyone went to the movies during World War II, so it was only natural that the American government found the film industry to be helpful in propagandizing the populace than at any time before or since. Hollywood stepped forward in a big way to lend its talents fully toward the war effort and victory. Made to convince American troops of the necessity of combating the Axis Powers and later released to the public as a rallying cry for support of the war. Introduces Germany as a nation whose aggressive ambitions began in 1863 with Otto von Bismarck and with the Nazis as their latest incarnation. Deals with the Nazi conquest of Western Europe in 1940 after the fall of Poland in 1939. Concentrates on the German bombardment of the United Kingdom in anticipation of Operation SEA LION, the planned Nazi invasion of Great Britain. The film begins with an overview of previous failed attempts to conquer Russia: by the Teutonic Knights in 1242, by Charles XII of Sweden in 1704, by Napoleon I in 1812. The invasion of China is explained in terms of the four-step plan for Japanese conquest: Manchuria for raw materials, China for manpower, the riches of the Indies and eastward to crush the United States. The dire consequences for the United States of an Axis victory in Eurasia are spelled out. The series faced a tough challenge: convincing a recently non-interventionist nation of the need to become involved in the war and ally with the Soviets, among other things. 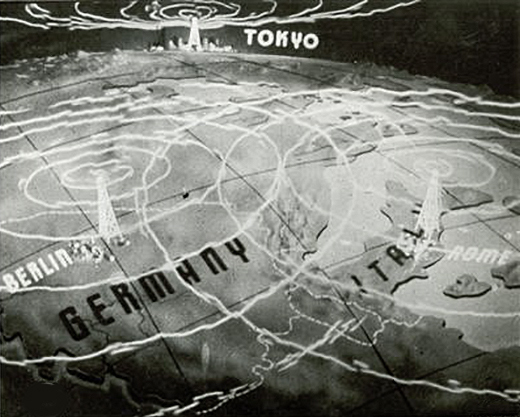 Capra and other directors spliced in Axis powers propaganda footage going back twenty years, and re-contextualized it so it promoted the cause of the Allies. Animated portions were produced by the Disney studios. Capra made his primary focus the creation of "one basic, powerful idea" that would spread and evolve into other related ideas. 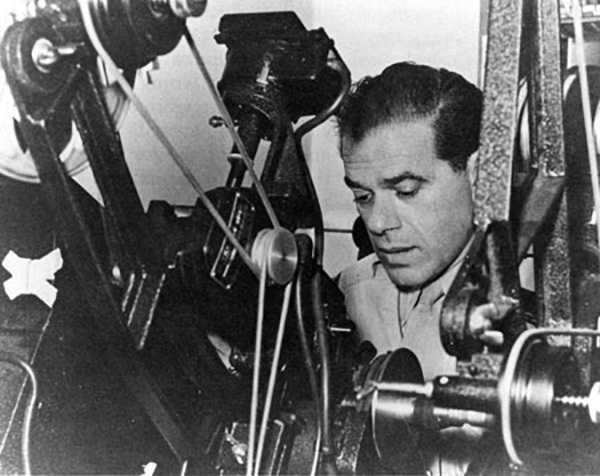 Capra considered one important idea that had always been in his thoughts: The Bible and its passage "Ye shall know the truth, and the truth shall make you free." His goal became to "let the enemy prove to our soldiers the enormity of his cause - and the justness of ours." Atlantic: Day 134 of 169 of Germany's Second "Happy Time," during which U-boats sink 609 Allied ships with little risk. Germany: Nazi SS leader Reinhard Heydrich, one of the main architects of the Holocaust, is mortally wounded in an assassination attempt in Prague by Czech patriots who toss a bomb into his open-top car. He will fall into a coma and die in a week. Reprisals against the Czechs will be severe. 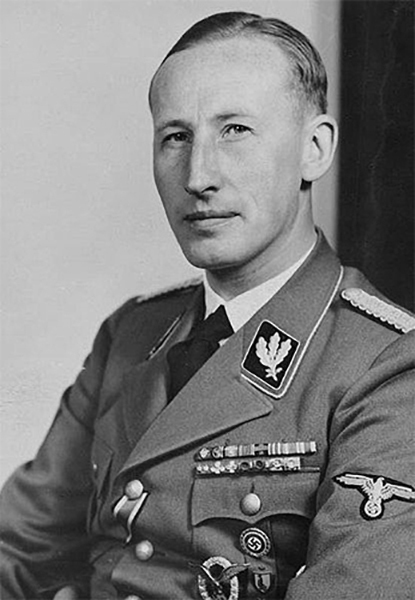 Reinhard Tristan Eugen Heydrich was a high-ranking German Nazi official and one of the main architects of the Holocaust. He is regarded as the darkest and most fearsome figure within the Nazi elite. Hitler described him as "the man with the iron heart." Among many things, he helped organize Kristallnacht and was directly responsible for the Einsatzgruppen, which murdered over one million people, including Jews, by mass shooting. In London, the Czechoslovak government-in-exile resolved to kill Heydrich. The British Joint Intelligence Committee authorized the assassination in a mission code-named "Anthropoids." A British-trained team of Czech patriots, having studied his routes of travel in Prague, tossed a converted anti-tank mine into Reinhard Heydrich's open-top Mercedes as it slowed for a hairpin bend. The explosion seriously wounded Heydrich and his driver. Heydrich was rushed to a hospital, but soon fell into a coma and died in a week. Infuriated by Heydrich's death, Hitler ordered the arrest and execution of 10,000 randomly selected Czechs. But after consultations, he tempered his response. The Czech lands were an important industrial zone for the German military, and indiscriminate killing could reduce the region's productivity. Upon Himmler's orders, however, over 13,000 Czechs will be arrested, deported, and imprisoned. Germany: The 152 students that openly displayed anti-Nazi posters on May 18th in Berlin are shot. Russian Front - North: Day 262 of 872 of the Siege of Leningrad. Russian Front - North: Day 23 of 658 of the Siege of the Kholm Pocket. Russian Front - South: Day 16 of 17 of the 2nd Battle of Kharkov, Ukraine. Some of the Soviets are able to break out of their encirclement but are hit by the Luftwaffe. The survivors surrender. Russian Front - South: Day 210 of 248 of the Siege of Sevastopol, Crimean Peninsula. MTO - Libya: Day 2 of 27 of the Battle of Gazala. The Free French forces at Bir Hakeim continue to hold the Italians off. East Africa: Day 23 of 186 of the Battle of Madagascar. CBI - China: Day 1,786 of 2,987 of the 2nd Sino-Japanese War. Day 13 of 124 of Japan's Zhejiang-Jiangxi Campaign, launched to punish anyone suspected of aiding the Doolittle raiders in China. Roughly 250,000 Chinese will be killed. PTO - Malaya: Day 98 of 357 of the Battle of Timor Island. PTO - Midway: The Japanese Fleet sets sail for Midway. On this same day, Admiral Nimitz orders his task force of carriers to Midway in hopes of ambushing them. PTO - New Guinea: US 5th Air Force B-17s bomb the air base at Rabaul on New Britain Island. PTO: B-24 Liberator GREEN HORNET goes down 850 miles west of Oahu due to mechanical malfunction. Seven crewmen are killed, three will spend the next 47 days adrift (during which one will die) until finally taken POW by the Japanese. One of the men is Olympic star Louis Zamperini. Surviving, healthy members of Crew #8, which included pilot Alan Phillips and bombardier Louis Zamperini, had recently been transferred from the Gilbert Islands to Hawaii to receive replacement crewmen and await reassignment; the B-24 SUPER MAN they flew on 20 Apr 43 having been rendered non-flight-worthy after being seriously damaged in a Japanese Zero attack. Their temporary assignment could be seen as a brief respite from the dangers of flying combat missions. Easy "milkrun" missions seemed to await them for awhile. But such would not be the case. The B-24D Liberator 41-24212 GREEN HORNET, a veteran of the bloody campaign for Guadalcanal, was a "war weary" bomber with significant issues that relegated it to non-combat errands and search missions, its parts often poached for other B-24s. It was notorious among the pilots there as a defective "lemon." Lieutenants Phillips and Zamperini, along with some new and former crewmates, were assigned to conduct a search for a lost aircraft and crew and given the GREEN HORNET for the mission. Lt Phillips had previously flown this plane as was therefore familiar with its weird operation and quirky behavior. A second Liberator, the DAISY MAE, accompanied them on the search for a B-25 that had crashed on the way to Canton from Kualoa that morning. Cloud cover at 1,000 feet forced both planes to fly very low, which gave them too little reaction time when mechanical trouble struck the GREEN HORNET. Some 850 miles from Oahu, the #1 engine failed. Phillips asked the Flight Engineer to feather an engine on the other side to compensate, but the #2 engine on the same side was mistakenly feathered, which sent the bomber quickly and severely angling to the left and dropping to the ocean, killing seven of the ten men aboard. The DAISY MAE, being miles away, was unaware of the crash. When the GREEN HORNET failed to show up for refueling at Palmyra Airfield, search planes were dispatched to search for the searchers, but to no avail. It was soon reported as missing with no survivors. But three men had survived the crash. Pilot Russel Allan Phillips, bombardier Louis Zamperini and tail gunner Frank McNamara made their way into two life rafts. For them, however, an horrific ordeal was ahead for the next 47 days. The three survivors, with little food and no water, subsisted on captured rainwater and small fish eaten raw. They caught two albatrosses, which they ate, and used pieces as bait to catch fish, all while fending off constant shark attacks and nearly being capsized by a storm. They were strafed multiple times by a Japanese aircraft, which punctured one of their life rafts, but no one was hit. Frank McNamara died on the 33rd day at sea. Lieutenants Phillips and Zamperini gave him as proper a military burial-at-sea as they could. On day 47, their ordeal at sea seemed to have finally ended when they washed up on the shore of the Japanese-occupied island of Wotje some 2,000 miles from the Green Hornet crash site. The Japanese Navy immediately captured them, though, and a second brutal ordeal began for them as prisoners of war. It was not until many months later that the United States was informed that Japan held Phillips and Zamperini in POW camps. USA: President Roosevelt orders that all defense contracts be free of racial discrimination. ETO - France: The first unified meeting of French resistance groups takes place, chaired by Jean Moulin. They unanimously recognize Charles de Gaulle as the leader of the movement. Russian Front - North: Day 627 of 872 of the Siege of Leningrad. Russian Front - North: Day 388 of 658 of the Siege of the Kholm Pocket. MTO - Italy: Day 6 of 20 of the naval and aerial bombardment of Pantelleria Island. US 12th Air Force hits targets on the island and on Sardinia. CBI - China: Day 2,151 of 2,987 of the 2nd Sino-Japanese War. Day 16 of 23 of the Battle of West Hubei. PTO - Alaska: Day 355 of 435 of the Battle of Kiska, Aleutian Islands. Day 17 of 20 of the Battle of Attu. The US continues mopping up, but the Japanese refuse to surrender. US 11th Air Force provides air support. PTO - New Guinea: Day 36 of 148 of the 2nd Battle of Lae-Salamaua. US 5th and 13th Air Forces provide air support. 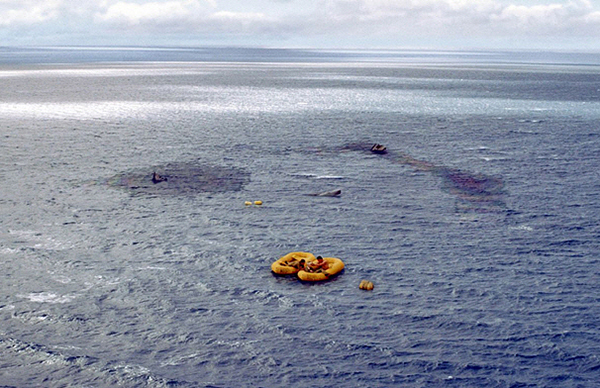 PTO - Philippines: The USS FINBACK sinks a Japanese cargo ship east of the Philippines. ETO: US 8th Air Force B-17s and B-24s bomb targets in France and Germany. ETO - France: US 9th Air Force B-26s attack railroad, bridges and marshalling yards. Russian Front - North: Day 116 of 191 of the Battle of the Narva Isthmus, Estonia. Both German and Soviet troops remain in their defensive positions. Russian Front - South: Day 50 of 60 of the Battle of Romania, 1st Jassy Offensive. MTO - Italy: Day 127 of 136 of the Battle of Anzio. RAF and US Air Forces provide air support. MTO - France: US 15th Air Force B-17s and B-24s bomb marshalling yards and airfields in southern France. CBI - Burma: Day 84 of 166 of the UK's Operation THURSDAY. Monsoon season begins and bogs down all operations in Burma. CBI - Burma: Day 79 of 147 of the Battle of Myitkyina. US 10th Air Force provides air support. Monsoon season begins and bogs down all operations in Burma. CBI - Burma: Day 57 of 302 of the Chinese Salween Offensive. US 14th Air Force provides air support. Monsoon season begins and bogs down all operations in Burma. CBI - China: Day 2,517 of 2,987 of the 2nd Sino-Japanese War. Day 41 of 259 of Japan's Operation ICHI-GO. CBI - India: Day 81 of 118 of the Battle of Imphal-Kohima. PTO - Alaska: US 11th Air Force bombs on Ushishiru Island, Kurile Islands. PTO - New Guinea: Day 1 of 83 of the Battle of Biak. US lands 12,000 troops. 5th Air Force provides air support. PTO - New Guinea: Day 165 of 597 of the Battle of New Britain. US 13th Air Force provides air support. PTO - New Guinea: Day 36 of 481 of the Battle of Western New Guinea. 5th Air Force provides air support. PTO - Solomon Islands: Day 209 of 295 of the Battle of the Bougainville Islands. US 13th Air Force provides air support. CBI - China: Day 2,882 of 2,987 of the 2nd Sino-Japanese War. Day 57 of 91 of the Battle of Zhijiang. US 14th Air Force provides air support. Japanese troops begin pulling out of China. Chinese troops are now 25 miles north of Foochow and take Loyaun. Day 49 of 60 of the Battle of West Hunan (near Zhijiang). Japanese troops continue withdrawing from southern China. PTO - Dutch East Indies: Day 27 of 52 of the Battle of Tarakan Island. PTO - Japan: Day 57 of 83 of the Battle of Okinawa. The USS MISSOURI bombards Japanese positions on Okinawa. PTO - New Guinea: Day 517 of 597 of the Battle of New Britain. US 10th Air Force provides air support. PTO - New Guinea: Day 401 of 481 of the Battle of Western New Guinea. US 10th Air Force provides air support. PTO - Philippines: Day 219 of 299 of the 2nd Battle of the Philippines, aka the Liberation of the Philippines or the Philippines Campaign. PTO - Philippines: Day 164 of 244 of the Battle of Luzon. 5th Air Force provides air support. The US 6th Army takes Santa Fe. PTO - Philippines: Day 79 of 159 of the Battle of Mindanao Island. 5th Air Force provides air support. PTO - Philippines: Day 71 of 135 of the Battle of the Visayas region. US 5th and 7th Air Forces provide air support. USA: The Central Intelligence Agency Act is passed by the US Congress. Succeeding the OSS (Office of Strategic Services), the CIA is afforded "no police or law enforcement functions, either at home or abroad."